The Gathering Place is a beautiful home that you can rent for any of your smaller sized events or if you are in need of overnight accommodations. We offer a homelike atmosphere that provides a wonderful venue for events such as bridal/baby showers, rehearsal dinners, business meetings, graduation open houses, birthday parties, small weddings, and holiday parties just to name a few. Rent the entire house for your next family reunion, crafting weekend, girl friend get-away, or any reason you would want a comfortable, homey place to stay. Conveniently located in downtown Sioux Falls, The Gathering Place is close to unique shops, great restaurants and the beautiful falls of Sioux Falls. We offer a fully equipped kitchen, four bedrooms with beds to accommodate 8-10, two bathrooms, a comfy den with a flat screen tv, buffet room, living room and dining room space. There is internet, a dvd player and a washer and dryer for your use. For those nice days we also have a fenced in backyard including a deck. A patio table and chairs along with a gas grill and backyard games are there for you to use as well. Let our place be your place to gather. The Gathering Place is a wonderfully warm and inviting home that was built in 1878. Decorated with antique and vintage furniture, the home is still family friendly and comfortable for guests of all ages. 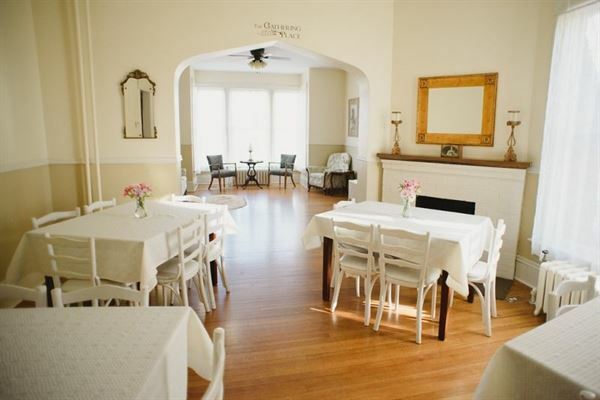 At The Gathering Place, we offer a homelike atmosphere for entertaining and hosting your own events and gatherings. Whether it is a meeting, family gathering, holiday party, graduation open house, or surprise party the house is equipped with almost everything you need! Our kitchen cabinets are full of everything a residential kitchen has plus more for entertaining such as punch bowls, beverage servers, platters, cake plates, large coffee makers, 52 place settings of dishes, utensils, linens and much more! We even have a gas grill and backyard games! Bring any food and beverages you would like. We will have the tables and chairs set up for you when you arrive to meet the needs of your event. We also rent the entire house for those that need overnight accommodations. Four beautifully decorated bedrooms, sleep 8-10. All bedding is provided along with two queen size airbeds with bedding if needed for a few extra people. Why stay in a hotel room when you can all stay comfortably together, have a kitchen, fenced in backyard, and a relaxing space to watch tv and movies. There is a washer and dryer for your use in the house and of course, cable and internet. Downtown Sioux Falls is just 2 blocks away. Enjoy the great shopping of downtown and our many wonderful restaurants. For hourly events our rate is $45 per hour with a minimum of three hours. To rent the house overnight, the cost is $300 Monday, Tuesday and Wednesday nights and $340 per night Thursday- Sunday. We do offer a discount when you rent the house for more than three nights and an additional discount for weekly rentals. If a guest cancels their reservation 60 days or less prior to the date of reservation, the deposit will not be returned. Loved the venue. Great people to work with. We recently used the Gathering Place for our groom's supper. It was perfect as we so many out of state guest that had flown in for the wedding and we didn't want to limit it to just a few people. It so much fun! As we rented the whole house the groomsmen stayed there together that night... was so fun for all of them. More than the perfect place to stay... Cindi the owner is wonderful to work with!